Still, I have at least some grudging respect for anyone who takes a dangerous stand on behalf of their own freedom, though it might be better if they fought on behalf of the rights of others. Nevertheless, in honor of the rule-breaking protagonist and her portrayers – not just Bette Davis, but the great, understated anti-auteur director William Wyler and a trio of writers that included undisputed auteur-to-be John Huston – I propose an incorrect version of a legit mixed drink classic. Mint Juleps, a longtime Southern favorite, are quaffed throughout “Jezebel.” Therefore, Jezebel the drink will brazenly break julep convention. Hopefully, no dueling-related tragedy will result if you try making this one at home. Build in an Old Fashioned/rocks glass. Add the whiskey, syrup, water and bitters to the glass. Stir to dissolve the syrup. Next, add the mint sprig(s) and very gently muddle. Even in this rebellious drink, you don’t want to smash the mint and release its more bitter flavors. Next, add plenty of ice — let’s be lazy rebels and not bother to crack the ice — and stir until its good and cold. Sip and contemplate the danger of beauty and the beauty of danger. It’s important to understand here that a traditional Mint Julep is made with bourbon, so my use of rye, which typically is slightly less sweet and more peppery in flavor, is fairly heretical. Agave syrup is, of course, dangerously Latino compared to the usual sugar or simple syrup, and bitters of any kind are usually not involved. Scandalous! In any case, the result is almost like drinking a peppermint flavored julep that’s ever so slightly sweeter than normal. My in-house guinea pig and I liked it. Anyhow, my ryes for this one were 90 proof Rebel Yell (!) 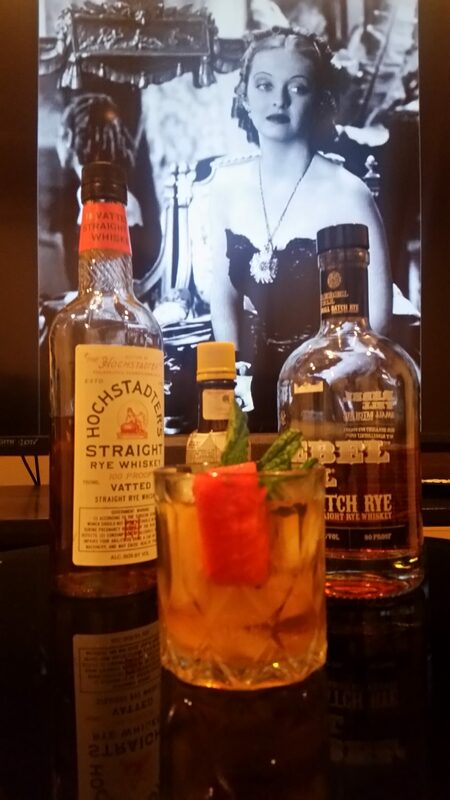 Small Batch and 100 proof Hochstadter’s Straight Rye Whiskey. I leaned very slightly in favor of the latter; it might have been the vanilla notes as well as the higher proof that won me over. If you’re going to be a rebel, you might as well go all the way.